Wikinews is a free-content news source wiki and a project of the Wikimedia Foundation. The site works through collaborative journalism. Wikipedia co-founder Jimmy Wales has distinguished Wikinews from Wikipedia by saying "on Wikinews, each story is to be written as a news story as opposed to an encyclopedia article." The neutral point of view policy espoused in Wikinews distinguishes it from other citizen journalism efforts such as Indymedia and OhmyNews. In contrast to most projects of the Wikimedia Foundation, Wikinews allows original work under the form of original reporting and interviews. The first recorded proposal of a Wikimedia news site was a two-line anonymous post on January 5, 2003, on Wikipedia community's Meta-Wiki. Daniel Alston, who edited Wikipedia as Fonzy, claimed to have been the one who posted it. The proposal was then further developed by German freelance journalist, software developer and author Erik Möller. Early opposition from long-time Wikipedia contributors, many of them pointing out the existence of Wikipedia's own news summaries, gave way to detailed discussions and proposals about how it could be implemented as a new project of the Wikimedia Foundation. In November 2004, a demonstration wiki was established to show how such a collaborative news site might work. A month later, in December 2004, the site was moved out of the "demo" stage and into the beta stage. A German language edition was launched at the same time. Soon editions in Italian, Dutch, French, Spanish, Swedish, Bulgarian, Polish, Portuguese, Romanian, Ukrainian, Serbian, Japanese, Russian, Hebrew, Arabic, Thai, Norwegian, Chinese, Turkish, Korean, Hungarian, Greek, Esperanto, Czech, Albanian, and Tamil (in that chronological order) were set up. On March 13, 2005, the English edition of Wikinews reached 1,000 news articles. A few months later in September 2005, the project moved to the Creative Commons Attribution 2.5 license. It reached 5,000 articles on April 29, 2006, and 10,000 on September 5, 2007. 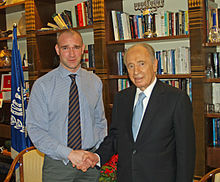 Wikinews reporter David Shankbone with Israeli president Shimon Peres in 2007. Wikinews reporters have conducted interviews with several notable people, including an interview in December 2007 with Israeli President Shimon Peres by Wikinews reporter David Shankbone. Shankbone had been invited to conduct the interview by the America-Israel Friendship League and the Israeli foreign ministry. Other notable interviews have included writers, actors and politicians, such as Augusten Burroughs, several 2008 U.S. Republican Party nomination hopefuls as well as various U.S. independent and third party presidential candidates, Tony Benn, Eric Bogosian, Nick Smith, John Key, and World Wide Web co-inventor Robert Cailliau. Above all, the central question about the Wikinews effort is its credibility. Making a newspaper is hard...Someone who wants to do it but doesn't really know how hasn't solved the problem by gathering a lot of other people who don't know, either. McHenry was skeptical about Wikinews' ability to provide a neutral point of view and its claim to be evenhanded: "The naïveté is stunning." Journalism is not a profession ... at its heart, it's just a craft. And that means that it can be practiced by anyone who is sensible and intelligent and thoughtful and curious ... I go back to the morning of Virginia Tech – the morning I decided I wanted to work [at the Wikimedia Foundation]. The conversation on the talk page that day was extremely thoughtful. I remember thinking to myself that if my own newsroom had been having a conversation that intelligent (I was offsite that day) I would have been delighted. So yes, [in my opinion] you absolutely have proved Robert McHenry wrong. And you will continue to. Wikinews has also had issues with maintaining a separate identity from Wikipedia, which also covers major news events in real-time. Columnist Jonathan Dee of The New York Times pointed out in 2007 that "So indistinct has the line between past and present become that Wikipedia has inadvertently all but strangled one of its sister projects, the three-year-old Wikinews... [Wikinews] has sunk into a kind of torpor; lately it generates just 8 to 10 articles a day... On bigger stories there's just no point in competing with the ruthless purview of the encyclopedia." Andrew Lih and Zachary M. Seward commented on the continuing issue in a 2010 piece in the Nieman Journalism Lab, "Why Wikipedia beats Wikinews as a collaborative journalism project." Lih wrote "it's not clear that the wiki process really gears itself towards deadlines and group narrative writing" and that "if you're trying to write something approaching a feature piece, it's much harder to get more than two or three people to stay consistent with the style." Lih considers Wikipedia's stricter "formula" for article composition an advantage in a large wiki with many editors. Wikinews contributors have at times expanded the site beyond text articles. Examples include Audio Wikinews, Wikinews Video 2.0 (test phase) and Wikinews Print edition, and Wikimedia Radio. Wikinews has worked for undergraduate journalism practice effort with University of Wollongong, with research published on neutrality of the project output, distinguishing it from other journalism practice opportunities. ^ "Wikinews.org Traffic, Demographics and Competitors - Alexa". www.alexa.com. Retrieved February 4, 2019. ^ Joanna Glasner (November 29, 2004). "Wikipedia Creators Move Into News". Wired. Archived from the original on June 7, 2007. Retrieved April 21, 2007. ^ Aaron Weiss (February 10, 2005). "The Unassociated Press". The New York Times. Archived from the original on April 15, 2009. Retrieved April 21, 2007. ^ Archived log entry of the anonymous post on Meta-Wiki. ^ Archived log entry of the userpage of User:Fonzy on the English Wikipedia, which states his real name. ^ Log entry of User:Fonzy editing this article on the English Wikipedia. ^ a b K.C. Jones (January 14, 2008). "Wikinews Gets Big Interview: Israeli President Shimon Peres". Information Week. ^ Rose, Adam (January – February 2009). "The Wikinews Ace: Why Shimon Peres sat down with David Shankbone". Columbia Journalism Review. Archived from the original on May 9, 2012. Retrieved May 11, 2012. ^ Asper, Colleen (April 2008). "David Shankbone with Colleen Asper". The Brooklyn Rail. Archived from the original on April 23, 2008. ^ a b Weiss, Aaron (February 10, 2005). "Jimmy Wales, president of Wikimedia, where articles written by users are open to revision by others". New York Times. ^ "Interview with Sue Gardner of the Wikimedia Foundation", Wikinews; October 24, 2007. ^ Dee, Jonathan (July 1, 2007). "All the News That's Fit to Print Out". The New York Times. Archived from the original on March 22, 2011. Retrieved December 31, 2007. ^ a b Seward, Zachary M. (February 8, 2010). "Why Wikipedia beats Wikinews as a collaborative journalism project". Nieman Journalism Lab. Nieman Foundation for Journalism. Archived from the original on January 7, 2015. Retrieved January 22, 2015. ^ David Blackall; Leigh T. Blackall; Brian Mcneil (2012). "Wikinews - a safe haven for learning journalism, free of the usual suspects of spin and commercial agendas". Archived from the original on July 13, 2014. ^ David Blackall (2013). Journalism students and Wikinews (Video). Retrieved August 28, 2013.